On the edge of Albania’s capital city of Tirana, Besim, 40, and his wife, Flutra, 37, and their children crowd inside a tiny one-room shack. Its walls are a mishmash of scrap materials like aluminum, cardboard and vinyl sheeting. It’s raining hard, and water leaks through the roof and rolls under the walls onto the damp floor. A wood stove, near the only mattress, emits some feeble heat. Outside, mountains of trash and recyclables are stored willy-nilly. Here, the only professions for the Roma are trash collecting and begging. 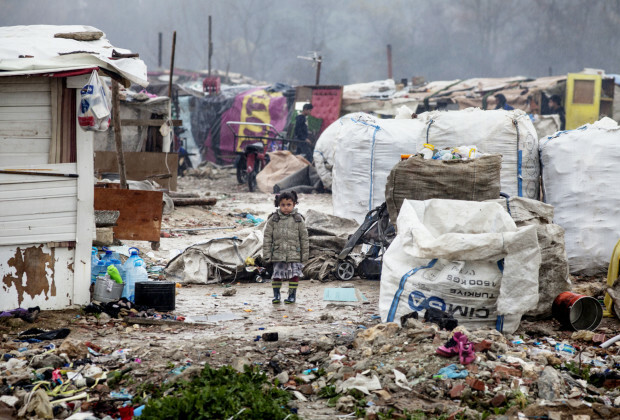 Liqeni Roma camp in Tirana, Albania, one of the poorest settlements in the city. Nearly 250 Roma people, including 105 children, squat in Liqeni, “Lake” camp. They live in makeshift housing within distance of the city’s well-manicured recreational park. There they live under constant threat of eviction with no access to running water and basic sanitation. 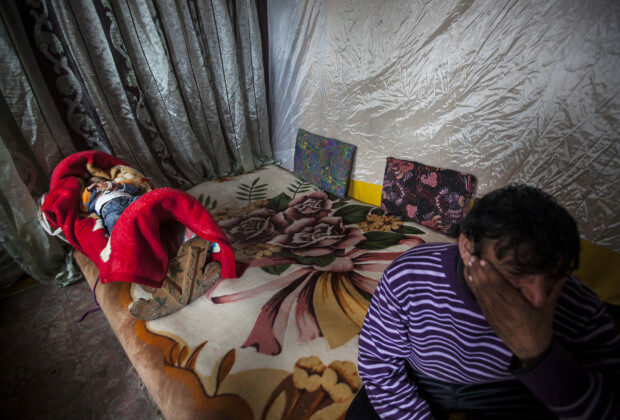 Besim sits on the mattress in his shack at Liqeni while his baby daughter lays swaddled nearby. 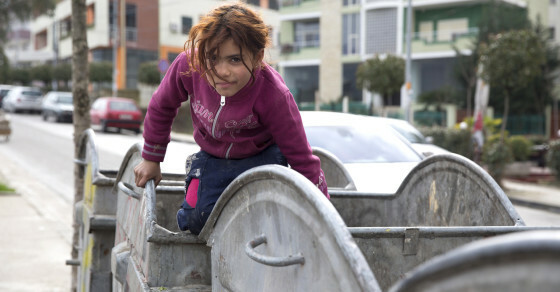 They live in a Roma camp near Tirana's artificial lake and city park. “In our town, there are no jobs. Here, it’s a little bit better,” says Besim. His family came to Tirana from Elbasan, a village in rural Albania. 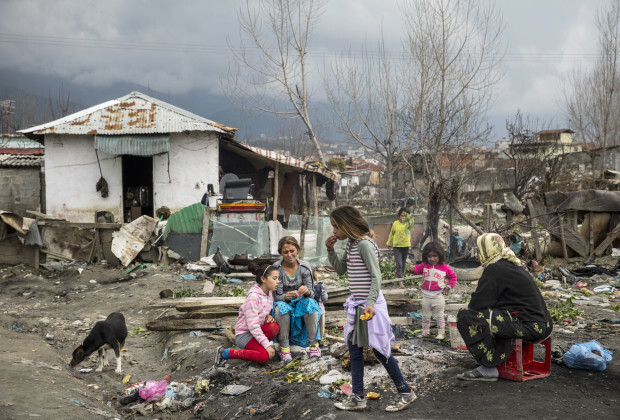 Throughout southeastern Europe such camps are common, but tiny Albania, a country known for widespread corruption, trafficking in drugs and people, poverty and high unemployment is a particularly grim place to be Roma. 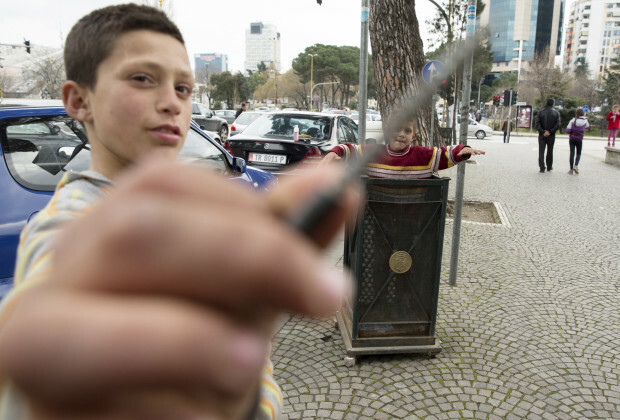 A Roma street child who earns money washing car windows, plays with a nail he found in the trash. No one seems to have accurate data on Roma in Albania—but foreign NGOs estimate there are between 50,000 and 70,000 of them living in the country. At Liqeni, there are no city services or schools. 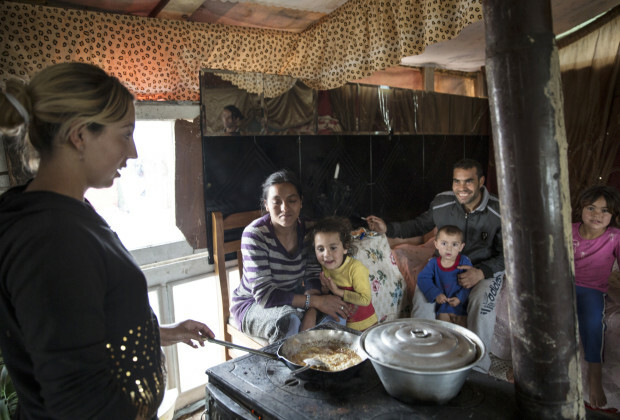 Reshat Nuredini's daughter cooks eggs in their shack in the Liqeni Roma camp in Tirana. Three generations of family share one room. “We all collect plastic and metals and sell them for money,” explains Reshat Nuredini, 50. He says a kilo of cans gets 10 cents. He returned to Albania after spending years in Greece when his residency paper expired. “It’s very hard here in Albania,” he says. He shares a small but cozy shack with his two of his daughters, their husbands and five children. Some of the squatters are recent returnees to Albania after pan-European financial crisis made life unbearable in more affluent countries like Greece and Italy. Others relocated to the lakeside settlement when the government sent bulldozers to demolish a camp at the city train station in 2012. Last year, 100 families were left in the streets after being forcibly evicted from a camp to make way for a development project. 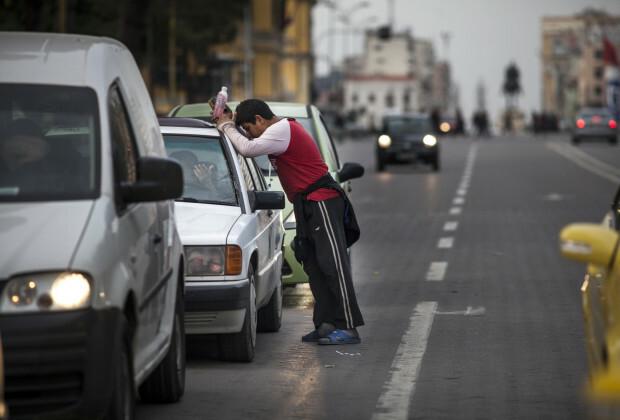 A Roma boy washes car windshields to collect money for his family in downtown Tirana, the capital of Albania. Near Tirana’s cafe area,Taiwan, I watched Roma kids wash car windshields, hoping to earn small change from motorists. When some started goofing around, their mother quickly appeared, beating them with her shoe until they got back to work. Brisilda Taco, who claims Roma ethnicity and who works with the Soros Foundation, says, “They often can’t write, so they asked me to help them fill out the forms.” Taco is the only of her three siblings to attend university and among about 50 in the whole country to earn a degree. Strolling down the streets of Blloku, with its chic nightclubs and restaurants, wild-haired child beggars work the streets. Shirtless boys lay shivering in the cold night, a coin collection box set nearby. 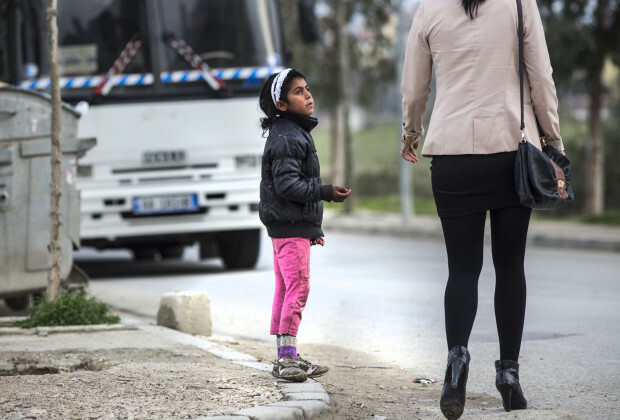 Child trafficking (for begging and prostitution) is common in Albania, especially amongst the Roma. 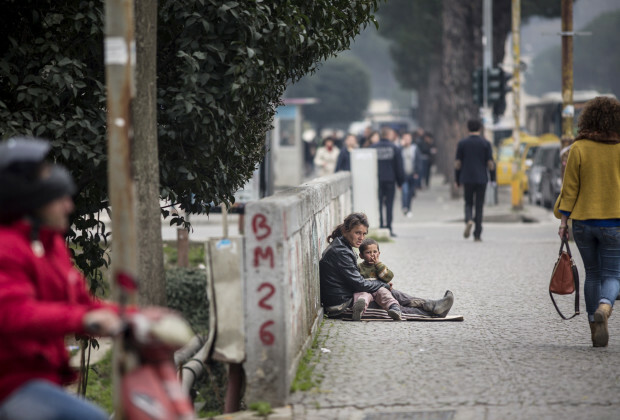 A Roma woman and infant beg on the streets of downtown Tirana, the capital of Albania. Ardit Reka, a case manager for ARSIS, an NGO that works with street children, has been trying to help the people of Liqeni, inviting them to send their kids to their center, which provides basic education and support. Lacking land rights and ownership makes them particularly vulnerable to eviction, and the government rarely takes responsibility for helping them. One exception is the case of 53 Roma families who were relocated to military barracks for temporary accommodation this year. 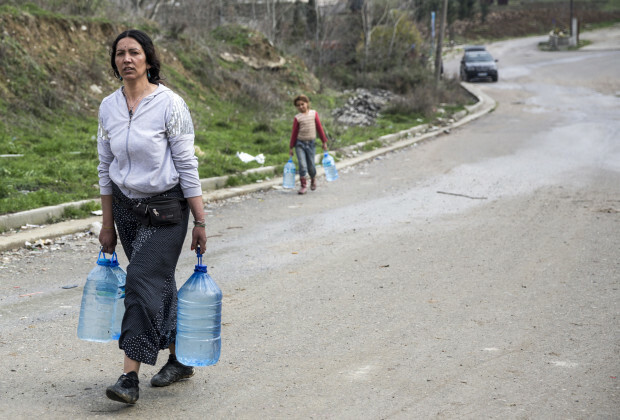 A woman and her daughter carry drinking water to Liqeni Roma camp in Tirana, Albania, one of the poorest settlements in the city. The European Commission held a conference last week in Tirana to discuss the situation of Roma in Albania. As part of Albania’s bid to join the EU, it is supposed to make improvements on human rights, alleviate discrimination and improve access to education, health and housing. Prime Minister Rama’s newly formed government is showing signs that it is prepared to help, according to an American Roma rights activist who preferred not to be named. 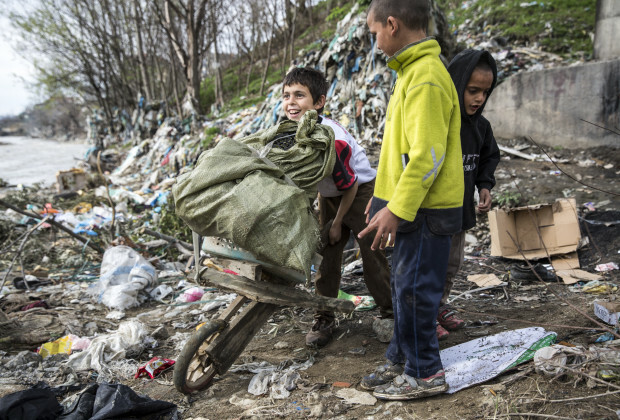 Children lift recyclable materials from the trash on the banks of the Tirana River at Babru, a small Roma settlement. The country receives millions of euros but very little of that, if any, gets invested in the ghettos. 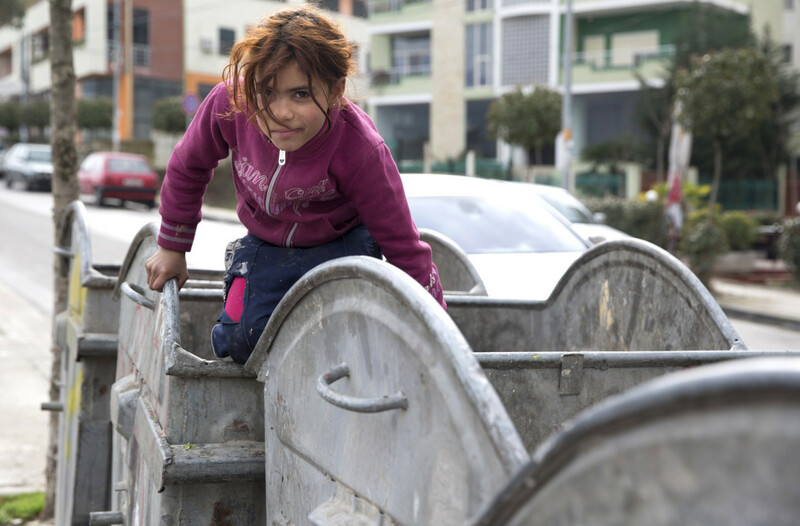 Many Roma are stuck in a vicious cycle of poverty. According to one of the activists who spoke at the conference, 80 percent of Roma have no professions and live in extreme poverty. A Roma child in Tirana, Albania, begs for money from a passer-by. Accessing social services is difficult if not impossible for them in Albania. Many Roma are not registered at local municipalities, either because they were born at home or because they move frequently. Even if they are able to receive welfare, the money is insufficient to buy food—about 30 euros per month. 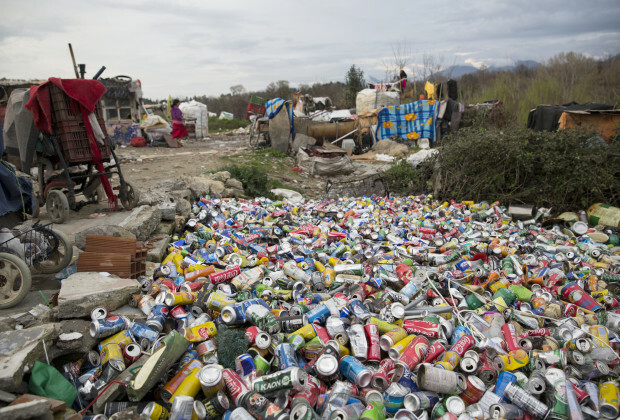 Cans collected at the Liqeni Roma camp in Tirana, Albania, one of the poorest settlements in the city. Residents live by finding plastic bottles and metal cans, which they can sell for 10 cents per kilo. Forcible evictions of Roma are a common problem throughout Europe. Children are not accepted in school because they are seen as dirty and poor and it’s difficult for adult Roma to get jobs. The EU considers them the most vulnerable people in society. 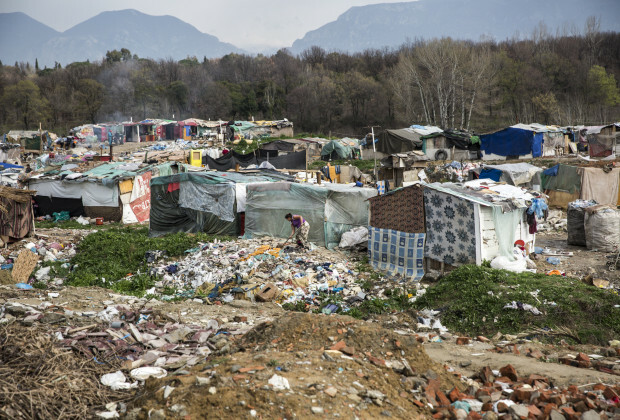 Albanian Roma families also live in shacks on unclaimed land at the banks of the garbage-strewn Tirana River. One by one, they are being removed. Silvi and her family at Babru, a small Roma settlement on the banks of the Tirana River. Silvi, a thin 26-year-old mother of three, lives by the river and fears arrival of the bulldozrs. She is illiterate and was married at the age of 12. At the time, she says, her family was living on the streets. She uses a pump to get water and cooks on a wood stove. The toilet is a trash pile near the river. When the river rises, the house is inundated by filthy floodwaters, she explains, showing the waist-high watermark on the wall. She says she can’t get welfare and medical care, and her last baby died during childbirth. Discrimination is the biggest problem they face, she explained. “People don’t like Roma,” she says.